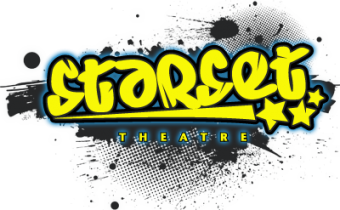 Starset Theatre |Stage School | Sing!Dance!Act! Currently working as a singer for P&O Cruise Line, on a world cruise! Currently touring carpenter for the Motown UK tour; has previously worked as Technical Stage Manager on the worldwide tour of Flashdance and on tours of Phantom of the Opera, Jersey Boys, Avenue Q and many more.. Currently working as a freelance writer and director, her first short film, ‘Stiff’ was selected to be screened at the Boston Women in Comedy Festival and New York City Comedy Short Film Festival. John has worked professionally since only 14 years old, starting in groups and then progressing to teaching before opening his own recording studio in 1998. In 2000, John and Elissa formed the company and started the first of their stage school classes. In recent years, John has also worked as Musical Director for a number of theatre groups including Dryburn Theatre Workshop, Darlington Operatic Society, South Moor Musical Theatre Group and Astravaganza Entertainment. Elissa studied dance, drama and music from a young age, taking exams with NCDTA, BTDA, LAMDA and ABRSM. Heavily involved with local theatre since a teenager, Elissa learned all aspects of producing and directing a show, supplemented by professional training, which gave her the practical skills needed to start Starset Theatre with John. A post-graduate Diploma in Business and an RSA Diploma gave her the additional skills to run the business! Helen is a freelance dance teacher and choreographer, working with primary schools, colleges and theatre groups around the north-east, as well as being resident ballet teacher at Trish and Trima’s School of Dance. She is an Associate Member of the NCDTA and a qualified BalletbeFit instructor. Helen also works throughout the year with a number of local amateur theatre groups, choreographing pantomimes, shows and concerts. Katie started dancing at a young age with the Hartlepool Stage Society before training in all aspects of dance. She graduated from the University of Sunderland with BA (Hons) in Dance and Media Studies, and then went on to pass teaching qualifications with Northern Counties Dance Teacher’s Association (NCDTA). She teaches in a variety of schools and dance schools and has choreographed for shows, competitions and charity events. Maureen has been part of the team since day one and has helped countless students over the years! As well as working behind the scenes organizing refreshments for classes and shows, Maureen is often also at classes and works front of house at many of our productions. She can usually be found helping backstage; calming pre-show nerves; serving our audiences with drinks and snacks or folding raffle tickets! Brett was originally a student at Starset Theatre, appearing on-stage many times before transitioning to a backstage and technical role. Assisted by his degree in Media Production, he has created many fantastic projections and ‘moving backdrops’ for our shows, and has most recently been involved with the update of this website! He has recently taken on more commissions for local colleges and is developing his freelance website work.